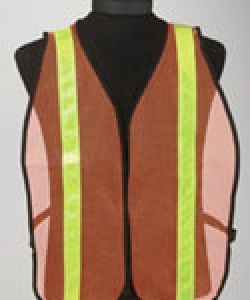 Refelective Mesh Safety Vest Lightweight, highly visible nylon mesh. Adjustable front closure with hook and loop materiall. Durable elastic side straps. 1 3/8" retroreflective stripes on front and back for increased visibility or night work. DOES NOT MEET THE REQUIREMENTS OF ANSI/SEA 107-1999.